Funny Franny here to brighten your day! 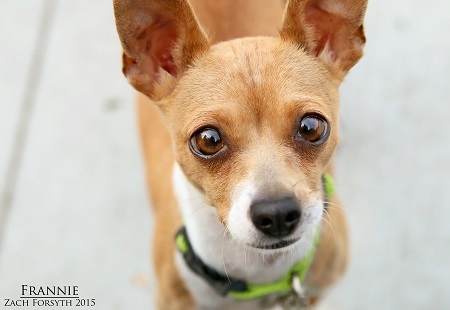 I am a delightful and loving 2 year old Chihuahua who is a ray of sunshine. I know sunshine has been in abundance lately, but you just wait winter is coming (any Game of Thrones fan will know what I’m saying), and you’ll be happy to have me by your side to liven up those dreary days. Not only is my slapstick comedy routine out of this park, but I do some pretty spot on impressions too (ask me to do the “Chile Bean” and I’ll cross my eyes for you :P)! I am playful and energetic, but not spazzy, and it should be clear with this personality that I get along with everyone! Cats, dogs, gremlins, I will make anyone smile! Oh, one slight thing, I still need work with my potty training. I’ll learn fast, but need a watchful eye at the beginning. What’dya say? Want to spend all winter laughing with your Franny Girl? Fill out the adoption application so we can schedule a meet and greet. I am fixed, vaccinated and microchipped. My adoption fee is $250.